The Station today is at the church of St. Prisca. Saint Prisca was baptized by Saint Peter when she was thirteen. She was thrown to the lions by Claudius (41-54), but the lion only licked her feet. She was then beheaded. Her home was made into a church by Pope Saint Eutychianus (275-283), who placed her remains under the high altar. It was probably one of the first gathering places for Christians in Rome. 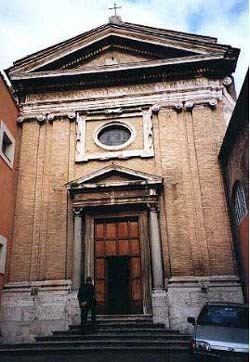 The Church of St. Prisca in Rome was one of the 25 parishes of Rome in the fifth century. The Epistle, Gradual, Offertory and Communion are a perfect adaptation of the passages in the Old Testament to Christ persecuted. He is ‘the meek lamb that is carried to be a victim’, and which God, by a striking revenge on them (Epistle) delivers from the hand of the sinner” (Offertory). The Gospel of St. Mark describes the death of Christ. The Introit and the Collect show that the Church, which continues and ‘glories in the Cross of our Lord Jesus Christ, in Whom is our salvation, life and resurrection’ (Introit). It is difficult to pinpoint the original dedication of this church. To begin, it is difficult to say whether or not Priscilla and Prisca are the same person. In addition, there may be two different Priscilla?s and two Prisca?s. One Priscilla is that mentioned, with her husband Aquila, by and with Saint Paul (Acts 18:1-4, Rom 16:3, 1 Cor 16:19, 2 Tim 4:19) who welcomed Saint Peter to Rome and gave him hospitality. Then there is the Priscilla, perhaps different, who is the patron saint of the catacomb on Via Salaria. There are also two Prisca?s, Roman martyrs of the first and third centuries. It seems probable that on the site of the present church was the house of the first Prisca?s family and that close by lived Aquila and Priscilla, Jews. Prisca was a young girl of noble birth who was baptized by Saint Peter at the age of thirteen. She was condemned during the reign of Claudius (41-54) to be exposed to the amphitheater where a fierce lion was unleashed on her, but the lion licked her feet and did not hurt her. Later she was beheaded, and her body was concealed on the Aventine and discovered in 280 by Pope St. Eutychianus (275-283), who moved it to this church and placed it under the high altar. This church?s Saint Prisca is remembered as the protomartyr of the West. She is said to have been baptized in the baptistery?s font, though this is unlikely since Peter would probably have practiced baptism by immersion or partial immersion. The first mention of the church is in connection with a cemetery of the fifth century where it is given as titulus Priscae. Adrian I (772-797) rebuilt its roof, and Leo III (795-816) embellished it and enlarged its title to ?Most Blessed Aquila and Prisca,? which has prompted some of the confusion regarding the dedication. Around 1455, Callistus III restored it, and it had to be restored again in 1600 and 1734. The church suffered greatly during the French occupation of Rome in 1798 and for some time it was in a ruinous state until repaired by the Franciscans, who cared for it then. Today it is entrusted to the Augustinians. Though little attention was paid to the discovery, in 1776 the walls of the house of Aquila and Priscilla, or possibly that of Prisca, were discovered. It would have been here that they received Saint Peter as their guest, and so this was probably the first place in Rome where ?two or three were gathered together? as a Christian community. In 1933 a passage was opened behind the high altar leading down to rooms of a first century Roman house. This can also be approached from the outside. In some of these rooms there are several important frescoes depicting Mithraic worship, including the seven steps of their initiation. Santa Prisca was the last of the series of stations in parishes organized by Gregory the Great. From tomorrow onwards, the stations take place in Major Basilicas. When at Saint Prisca, note her relics (under the altar of the confessio), as well as those of Sts. Martesia and Claudia. Location: At the Piazza S. Prisca on the Aventine Hill, along the Via Santa Prisca.